No, you aren’t seeing double. This and the previous book reviewed in this corner have very similar main titles, distinguished only by, as my old Latin teacher would call it, number. 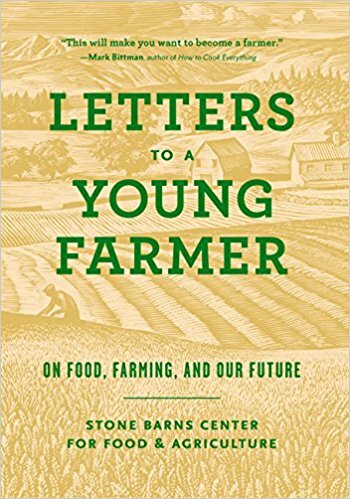 This is the first book Stone Barns has published, and a remarkable one it is. Practically every writer of note in modern alternative agriculture has written an essay in it. Thirty-six of them, from Wendell Berry, Joan Gussow and Eliot Coleman to Joel Salatin, Allan Savory and Temple Grandin have weighed in. That is a somewhat wordy but lofty goal, and only occasionally does this book reach it. As one would expect when so many prominent thinkers are re-cruited to give their opinions, there is a level of ambivalence to the book that is hard to ignore. Anna Lappé, for instance, has come to see clearly, that “Farmers protect land and water, preserve cultural traditions, nourish communities, promote health and well-being”. But these virtues are bestowed about a dozen pages after Mary Berry recalls that farmers also vigorously defended a federal pro-gram — of which her grandfather was the principal author — that led to hundreds of rural southern communities enjoying a “pretty good economy around small, diversified farming in those days”, but that was destructive of soils and human health. It was based on farms getting a federal tobacco allotment. Raj Patel, for an even more extreme example, makes a passionate case about the role of white colonialism in turning soil from a collective blessing shared by all in indigenous communities into private property, concluding “If you have title to the ground on which you stand, you traffic in stolen goods”. In the very next essay, with nary a blush, Barbara Damrosch advises the audience of young farmers on what she calls their biggest hurdle — how to buy land. But perhaps it is just unfair to hold farming to any higher standard than the rest of our economy, in which it is embedded. Some of the authors – Temple Grandin, Alice Waters, Anna Lappé, Mary-Howell Martens – tell their own coming of age stories. I was surprised by how many of them, like NOFA members, came to an enthusiasm for this life despite growing up outside it, often based on an early chance exposure. Many give pithy advice that they have come to appreciate, and which, to this farmer of 30 years, seems wise.